That’s not a greeting often heard even though Congress officially designated September 17 as Constitution Day in 2004. Before then, September 17 was known as Citizenship Day, the designation given to that date by Congress in 1952. The holiday’s origins are even earlier. Citizenship Day had been known as “I am an American Day” and was celebrated on the third Sunday in May pursuant to an act of Congress signed in 1940. But how and when did “I am an American Day” start? In a letter to the Editor of Broadcasting magazine (June 28, 1948), Martin Pine claimed his brother, Arthur Pine, gets the credit. According to Mr. Pine, during the New York World Fair, which took place in 1939-40, songwriters brought his brother a song called “I am an American.” Arthur Pine, who was handling publicity for bandleader Gray Gordon, convinced the bandleader to use the song on the radio and later Arthur Pine arranged for “I am an American Day” at the World’s Fair. The celebration was picked up by the Hearst newspapers and came to the attention of President Franklin Roosevelt who signed the legislation officially recognizing the day. Is that really the beginning of the observation? Not if you consult a granite monument in front of historic house on New York Avenue in South Huntington. 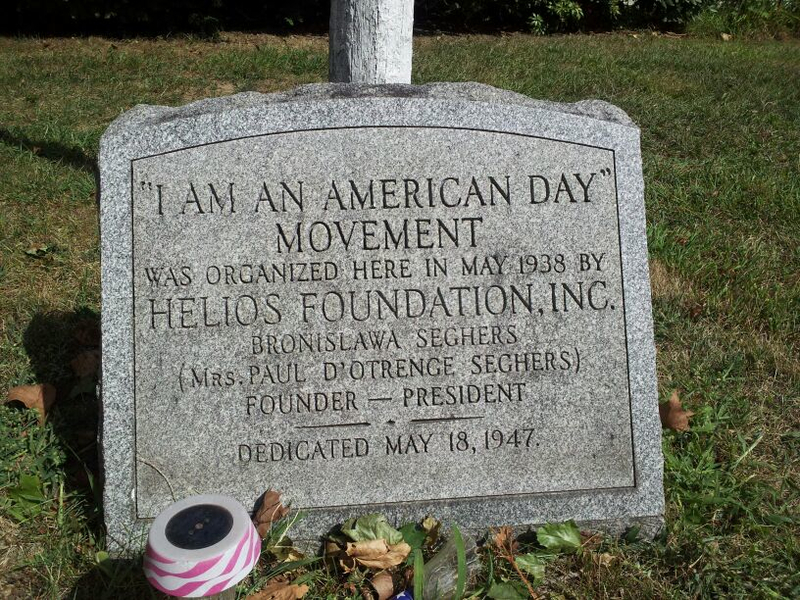 According to the monument, “I am an American Day” was first held in Huntington in May 1938—a year before the World’s Fair. In Huntington the third Sunday continued to be celebrated as “I am an American Day” despite the change to Citizenship Day made by Congress in 1952.